A sight like this is a fairly common occurrence on modern city streets these days, so common that I am sure more than a few of us find little to move us in its pixels. Regrettable accidents and violence have become so much the norm that, if one were to attempt to catalogue all the incidents recorded in a single large cityspace, it would be less an exercise in fraught film noir intensity and more one of beauraucratic detachment. Nevertheless, I would like to recount the experience of one of many of these incidents in a small town to which I have no small attachment- not just for the fact that it was one of many human tragedies that occurred today, but for the manner of its recounting to me. 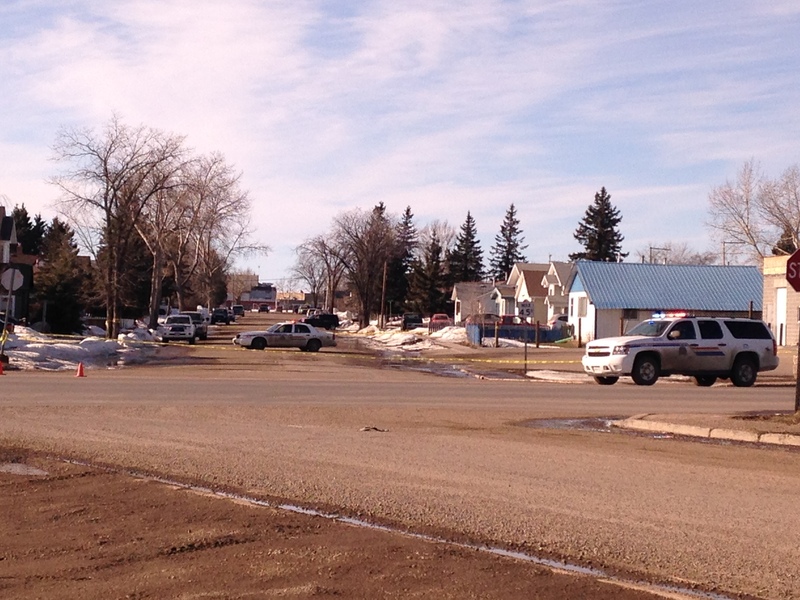 Yesterday morning, an elderly lady was struck by a car on the corner of a busy Dawson Creek street. The lady succumbed to her injuries and died. I was just down the street at the time, knowing nothing of the police tape, ambulances or other trappings of tragedy being unrolled blocks away. A brief, half-heard wail from a siren was all the real-time sensory input I received. The comment was so cryptic, the sirens so common, I failed to connect the two in my mind. I followed the thread and asked the wheres and whens of the situation, learning it was at a laundromat where everyone in town comes to get their coveralls and work clothes cleaned. A common fixture of northern life, drawn into a drama for a day as the methodical wheels of investigation cordoned off its borders. The fact I had put off my own work laundry until later that day was not lost on me. People on the thread chatted about speeders on 8th Street. All of the usual cries for checks, balances, solar-powered speed monitors and other shawls of human comfort abounded. I continued my work, for what else is there to do when only supposition and righteous anger abound. Their anger is not unfounded- this is a small, farming and foresting town whose population swells to almost ten times its size every winter to accommodate the multitudes of petrochemical workers in brand new, state of the art trucks designed to persevere over the most intensely unforgiving terrain. 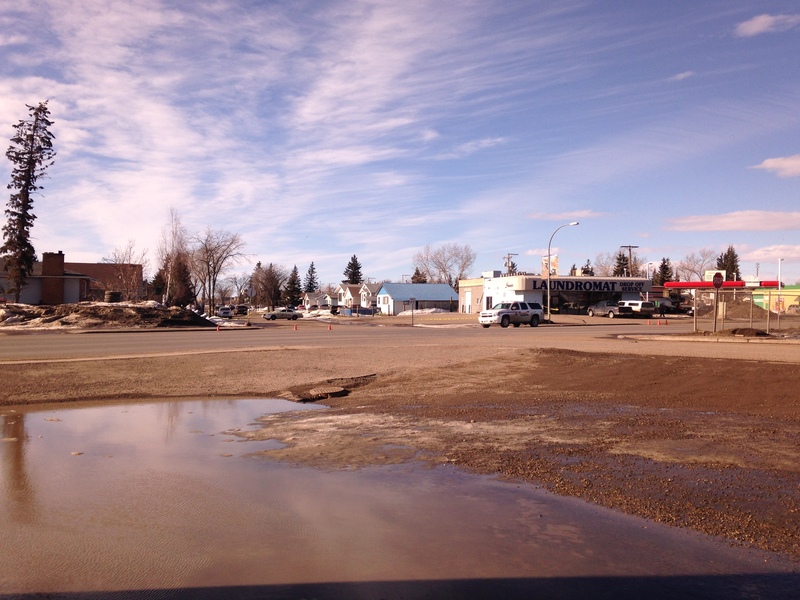 This little main street can hardly bear the strain of these vehicles, the sand and gravel, liquid calcium and effluent semis that traverse it many times a day. I had occasion to be on the overtaxed 8th Street later that day. 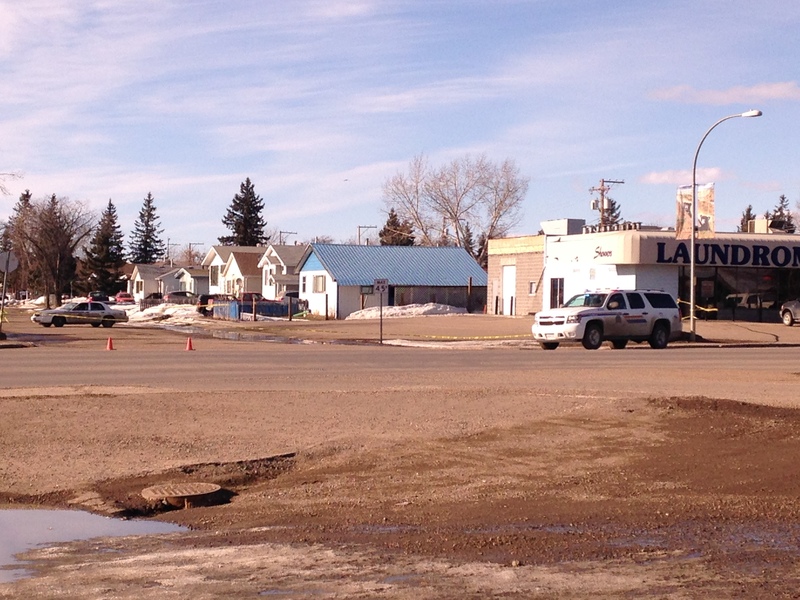 I was rather surprised to see the flashing LED lights of the RCMP still extant outside the laundromat. Pulling over, I stopped to take these pictures of the dregs of tragedy, the flapping wasp-striped police tape and the deserted parking lot in front of the place that is usually constantly filled with traffic. The wind had been gusting along with the full moon since the night before, slapping and rushing the buildings and whipping up giant puddles of water where once there had only been snow. My mother told me that winds like that meant that misfortune was in the air- the Wild Hunt would come out at more times than just the top and bottom of the year to race over the landscape and initiate tremors of tragedy. As I watched the tape billow in the wind, I knew as I always do that she was right. It is true that the seeds of sorrow spread by such winds find fertile ground in a world where people have lost not only their caution and value for life, but have lost the knowledge of the subtle signs of nature to tell them when the ice of reality upon which they tread is thin. It has long been understood by first responders that, regardless of statistics, the time of the full moon is a ‘hinky’ one. It has been long understood by the natives of every boreal country that the northern lights are connected to spirits and the dead. It has long been understood by humans that the highways and biways are areas of transition and change, a shifting landscape not unlike either the wind that rushes over the melting snow or the auroras themselves. Yet in the increasing urban rush to attain, suffer and forget the pain of that attainment we have forgotten that we still live in the world and that we can and should try to preserve the life that surrounds us. We can and should try to remember the feel of a wind in our hair and know when it is happy and joyous or troublesome. We can and should remember the physics that taught us how to make our fast machines and recall that one can only arrive at a destination so fast over land- the speeding that costs so greatly can only result in a gain of a few moments for the speeder. Natural laws of both subtle and empirical nature are forgotten in the overamped, underslept, desperate search for Attainment. In such an avid search, we lose life, we lose connection, we will lose our freedom and will ultimately lose anything that connects us to the world around us. Small towns with landmarks that matter will become faceless urban landscapes, interchangeable and thus dispensable, all the more ready to play the backdrop for whatever tragic loss chaos has to unfold. So it was that a small town became the backdrop for one of another set of statistics yesterday.